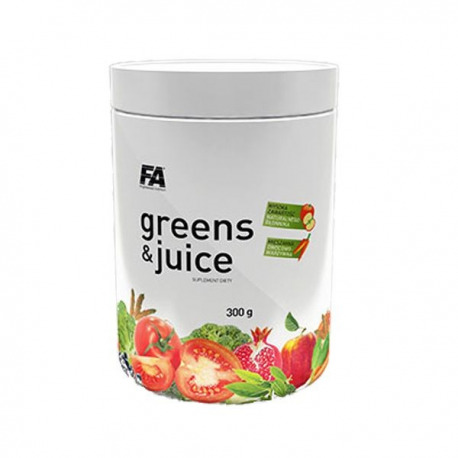 GREENS & JUICE is a powder that you can use to prepare a delicious beverage or can be added to protein shake, dairy products or favourite juice. Wide range of active ingredients delivered by GREENS & JUICE boost energy, increase metabolism, improve immunity, accelerate post-workout muscle recuperation and augment antioxidant capabilities of the hard working body! During each resistance or endurance training lot of free radicals is generated. The main sources of free radicals are all oxidative processes that are held in human body. Moreover, the more fit and active you are the more free radicals is produced in working tissues. When inadequate diet is consumed, the body becomes depleted from active substances with antioxidant properties. In that situation every active person are exposed to unwanted activity of free radicals. GREENS & JUICE is perfect for your diet, providing all antioxidants you need. Main ingredients are spirulina, barley grass, probiotics and many others that have positive effect on your body. 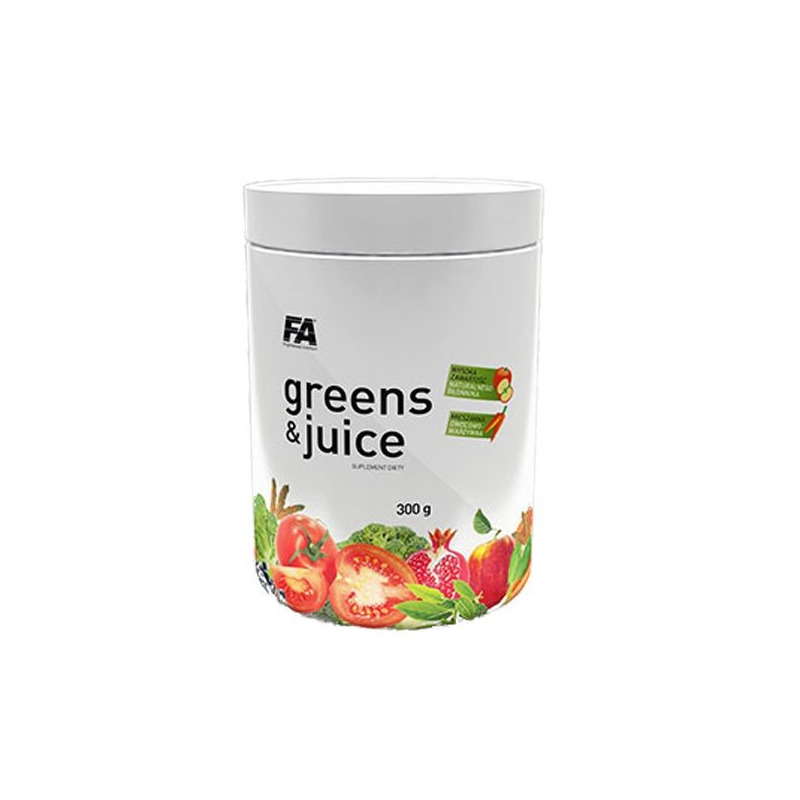 Berry and vegetables blend contains a vast range of ingredients: vitamins, minerals, polyunsaturated fatty acids like omega-3, -6, -9 and natural enzymes responsible for correct functioning of your whole body. GREENS & JUICE is a perfect choice for every active person! The powder for a delicious drink with lemon flavour preparing based on vegetables and fruits which supplementing the diet with psyllium husk and a many active substances derived from a mixture of greens & juice. Ingredients: Psyllium seed husk (Plantago ovata Forssk. ), powdered Greens & Juice mixture [soy lecithin (Glycine max (L.) Merr. ), spirulina (Arthrospira platensis), prebiotic (fructo-oligosaccharides as Actilight®), oat bran (Avena sativa L.), apple fibre (Malus domestica Borkh. ), barley grass (Hordeum vulgare L.), wheat grass (Triticum aestivum L.), acerola berry dry extract (Malpighia glabra L.), chlorella (Chlorella vulgaris), soy sprout (Glycine max (L.) Merr. ), green beans (Mung – Phaseolus mungo L.), red beet root (Beta vulgaris L.), pomegranate (Punica granatum L.), probiotic (Lactobacillus sporogenes), siberian ginseng root dry extract (Eleutherococcus senticosus Maxim. ), carrot (Daucus carota subsp. sativus L.), tomato juice (Solanum lycopersicum L.), astragalus root (Astragalus membranaceus), spinach leaf extract (Spinacia oleracea L.), broccoli (Brassica oleracea L. var. italica Plenck), acai berry (Euterpe oleracea Mart. ), goji berry (Lycium barbarum L.), green tea leaves dry extract (Camellia sinensis (L.) Kuntze), grape seed extract (Vitis vinifera L.), elderberry whole fruit (Sambucus nigra L.), blueberry whole fruit (Vaccinium myrtillus L.)], aromas, acidity regulator (citric acid), anti-caking agent (sodium dioxide), sweetener (sucralose). Recommended use: Mix 2 scoop of powder with 200-400 ml of water. Consume immediately after preparing. Warnings: Do not use if you are allergic to any of the product compounds. Contains: gluten, soya. Do not exceed recommended daily dose. Food supplements should not be used instead of a varied, well-balanced diet. Keep out of reach of children. Store in dry and cool place. Protect from direct sunlight.